The Napoleonic 20 Series features games of only modest complexity, each with a focused scope and low unit density (typically fewer than twenty pieces per side). The dramatic, fast-playing turns feature compelling historical narrative told through random event cards and the exciting ebb and flow of military units maneuvering and engaging in battle on the map. Replete with the surges, lulls, and "friction of war" that gives a great feel for the parry-and-thrust of a Napoleonic grade battle as armies close to bayonet-point to see which will break first! 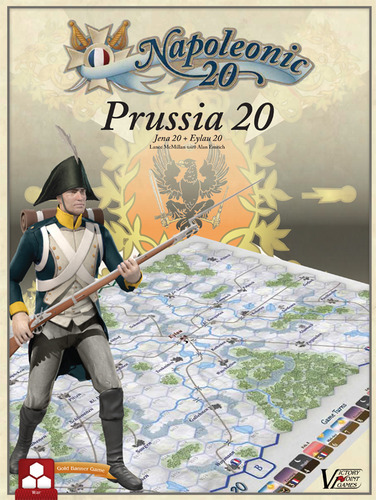 Jena 20 2nd Edition (October, 1806) highlights the stunning French victory which shattered the vaunted Prussian army at the twin battles of Jena and Auerstadt. With the Prussians realizing they have already been out maneuvered, their army is desperately trying to re-position itself while the French attempt to encircle and destroy them. Can the Prussian rear guard under Hohenlohe hold off Napoleon's Grand Armée long enough at Jean to allow Brunswick's main body to crush Davout's lone French corps under which blocks their path to safety, or will the "Iron Marshal's" veteran 3rd Corps stand firm against three times their numbers and seal the Prussian's doom? The fate of two great empires is yours to decide. Fought in some of the most severe weather conditions imaginable, the confused and indecisive battle of Eylau 20! (February, 1807) stands as a testament to the misery and horror of warfare. In the dead of winter, Russian General Levin August von Bennigsen halted his exhausted army at a small deserted crossroads village and prepared to give battle. For two days, in sub-zero temperatures with heavy snow falling almost continuously, Napoleon's troops battered themselves against the unyielding Russian lines to little avail. Is the historical bloody and inconclusive draw the most likely outcome, or can you do better than the actual commanders and manage to eke out a victory in the terrible "Battle in a Blizzard?"